This week has brought a common dilemma when it comes to establishing and sticking with a workout schedule: travel. This week I’m in Washington, D.C. and I’ve been looking forward to the trip, not just because it’s D.C., but also because it’s an opportunity to use my pedometer and strapless heart rate monitor in a new environment. I’ve been able to successfully exercise on the road before, but having this equipment has made it so much easier to monitor not just my exercise (running the National Mall!) but my regular, non-exercise activity (am I walking enough while I’m exploring the city?) (Yes.). When you’re traveling it’s easy to justify not exercising, but when you’re wearing your pedometer and heart monitor, you’re reminded of the health journey you’re on. Plus, it’s nice to have a chance to change things up a bit, whether it’s the hotel fitness center or a new place to run or walk. I recommend checking the weather forecast so that you can take advantage of being outside if at all possible.Most important is to make room in your luggage for your exercise equipment – as much as you’ll need but as little as you can get away with. For instance, your SHOES, workout clothes (don’t forget the sports bra, Ladies! ), ear buds/music device, arm band, hand and/or gloves and the right amount of layers if it’s cold, maybe a water bottle, and, of course, the right SOCKS. 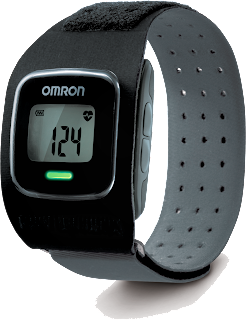 Regarding the Omron Strapless Heart Rate Monitor, as I’ve worn it this week I’ve found that, for me, it gets more accurate readings if I wear it with the face on the underside of my arm (which is how I wear a watch, so I prefer it that way). It was made to be worn on the top of the arm, but my experience shows that wearing it the other way works, too (nevermind the sweat, por favor). 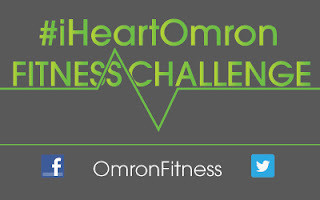 Don’t forget: if you’re interested in a chance to win your own Omron Fitness equipment, RSVP for the upcoming #mamavation #iHeartOmron Twitter Party to be held on Wednesday, February 20th, 8-10 Eastern Time. 2 Winners will be chosen to win their own Omron pedometer, or scale, or strapless heart rate monitor (same kind I’ve been using during the #iHeartOmron Fitness Challenge). I hope you have a great trip!I love DC even if it is for business a little fun never hurt either. 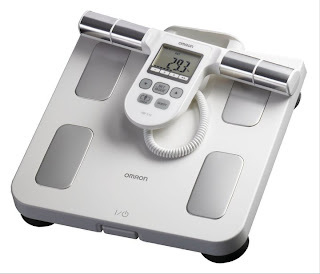 Good luck testing out all your stuff! It's definitely hard to stick to a workout schedule when traveling, but having your equipment does make it easier and will remind you to do so.